The Penn State Student Broadcasting Story tells the 100+ year history of one of Penn State’s most distinctive traditions. The Penn State Student Broadcasting Story plaque was gifted to The LION 90.7fm from the Penn State Media Alumni Interest Group and can be seen in their HUB-Robeson Center facilities. Born out of a vision for enhancing campus life, student broadcasting promised a new and very real expansion upon the classical idea of the student body as the heart and soul of the living university. To accomplish this, the Senior Gift of the Class of 1912 equipped The Pennsylvania State College with one of America’s first student-operated radio stations. By the late 1940s, fresh from American victory in World War II and in a booming economy, Penn State was ready for a new chapter. The Senior Gift of the Class of 1951 returned student radio to the airwaves as WDFM in 1953, perpetuating the spirit of pioneering student broadcasters. Located in 304 Sparks, WDFM was one of the area’s first FM stations. WDFM evolved in the 1960s and ‘70s, reflecting the evolution of American culture. Student broadcasters diversified their programming, including weekly USG press conferences, more than 50 weekly five-minute newscasts, dramatic literary readings, and live broadcasts of the Metropolitan Opera from Lincoln Center in Manhattan alongside “middle of the road music” like jazz and folk. University Chapel services continued to be broadcast each Sunday into the 1970s to an edgier student body. By the late 1970s, WDFM celebrated more than 25 years and a litany of successful graduates who were shaping the explosion of American popular media over the airwaves, behind the scenes, and in the boardroom; leaders in fields like journalism, broadcasting, and advertising, their professional fortunes rising with the rising influence of radio and television at places as varied as NBC, Westinghouse, HBO, Showtime, and NASA. A changing media landscape came to impact student life in the 1980s. One student captured the growing tension in an April 1980 Daily Collegian article, explaining that some professors and administrators believed student broadcasting belonged “in the hands of professionals” rather than with young people. An October 1981 editorial cites Senior Vice President for Administration Richard E. Grubb’s promise that administrative goals for professional broadcasting would be “carefully designed to have no effect on WDFM. WDFM has a rich history, a long tradition and a strong loyalty which should not be disturbed…” Lisa Posvar Rossi, WDFM’s 1981-82 general manager, later reflected: “We felt threatened … I remember setting up meetings at which we said we wanted to maintain independence. We did end up stalling the conversion to a public radio station, for a little while at least.” Yet by 1985, WDFM’s call letters were changed to WPSU and with this change came greater faculty influence, the loss of student general manager authority, and a shift in mission away from original content produced by students and toward NPR syndication. The historic and challenging lessons of time shaped the cultural and institutional character of Penn State student broadcasting, which has been defined since The LION’s founding by three bedrock principles. First, to be independently programmed and operated, led by an elected student president and general manager. Second, to honor a mission of public service to the Penn State and Central Pennsylvania communities, realized through open membership to students of any academic major as well as community members. Third, to pursue institutional support through technical, professional, financial, and legal assistance that respect freedom of thought and expression as imperatives for authentic public service. 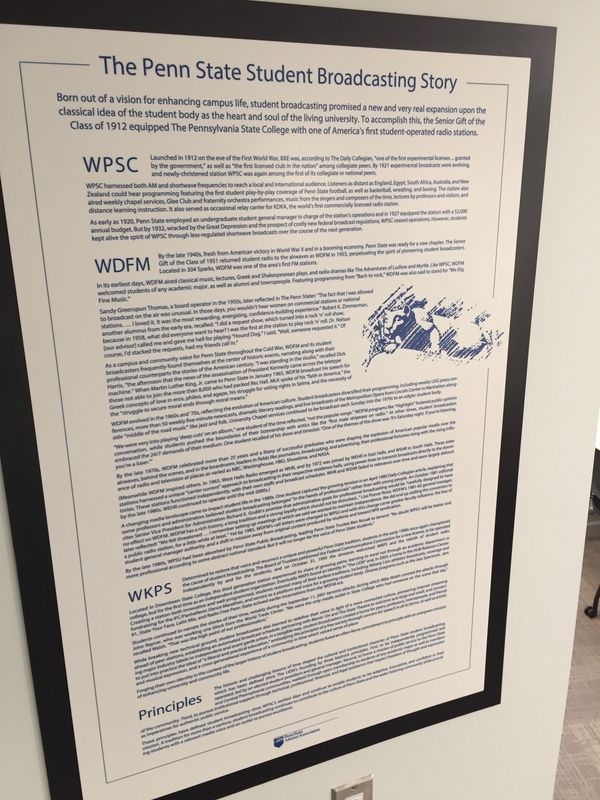 These principles have defined student broadcasting since WPSC’s earliest days and continue to enable students to be adaptive, innovative, and confident in their mission. A tradition for more than a century, student broadcasting continues to contribute to the culture of Penn State and the wider listening community while providing students with a relevant media voice and an outlet to pursue excellence.